Raphaella's famous masterclasses make an everlasting impression. She has made a name for herself as an outstanding pedagogue. Masterclass at the Ingesunds Musikhögskola, SE. Raphaella loves to work with people, especially with pupils. Music is something she likes to share. 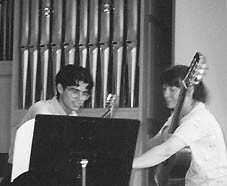 She is internationally praised as a teacher for both guitar and chamber music. 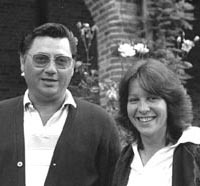 Besides her chair at the Lemmens Institute in Leuven, she regularly gives masterclasses worldwide. During her own education at the conservatories of Antwerp and Brussels, she would participate at the masterclasses of José Tomàs in Alicante and Santiago de Compostella in Spain, during summer holidays from 1973 through 1977. 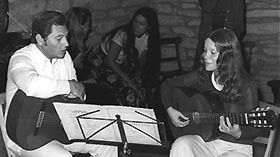 His lessons were so inspiring, that some years later, Raphaella did invite Pepe to Belgium to participate at the annual Academix International Guitar Happening. After eleven editions (between 1983 and 1995) Academix ended that glorious series of Guitar Happenings. Today Raphaella is giving masterclasses during the whole year at universities, conservatories and festivals around the globe. - Last update : 27 MAR 2004 - rejo © - Be well-informed: subscribe to Raphaella's G-zine.